The Royal Solar Lamp Mount has 5 super bright white 10mm LEDs to illuminate or line your walkway, patio, or deck. This energy efficient, super-bright lamp light uses a special patented cone reflector to make the light brighter than standard solar lights. 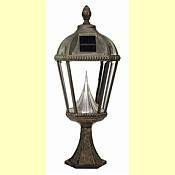 The gas-light design of our solar lamp light is classic and adds an elegant appeal to your front yard or backyard. Solar lamp lights receive their energy from built-in batteries charged daily by the sun, which in turn light the 5 super-bright LED bulbs. Each solar lamp light has real beveled glass panes that add to the late 19th century style. No maintenance is required with the powder-coated cast-aluminum solar lamp lights because they are weather and rust-resistant. Worry-free, the solar lamp light turns on automatically at dusk and off at dawn. The solar lamp light can be bolted down (bolts included) and has a weathered bronze finish (GS-98F available only in black). This lamp post light is available in three styles for attachment to an existing lamp post, to a deck or pillar, or to a wall. Solar lights store the sun's energy during the day and release that stored energy at night. Solar-powered lights are a perfect match for most situations and include a long lasting Hi-Tech solar panel. Solar Lighting does not require any wiring, so you will not have to tear up any of your gardens, lawns, or landscaping to install them. Thanks to the increasing popularity of solar lighting for accent and security, there is a larger variety of designs and styles available. Each solar light comes complete with its own rechargeable batteries. The lights are totally weatherproof and suitable for year round use. Please make sure to choose the type of mount and color in which you are interested. Has 3 inch fitter to fit most lamp posts. Available in black only. Base is designed for attachment to a deck or flat top pillar/post. Wall type mounting bracking for attachment to walls or vertical side of a post.